Christmas often seems to be commercial and trite, with Coca-Cola’ glittering red truck on TV, and the smell of tangerines in the supermarkets, but we assure you, for the Poles, it is a big deal, especially when it comes to food. And since the most important meal of Polish Christmas is the Christmas Eve supper, we’ll reveal the secrets of the most traditional Polish recipes for the dishes that are fundamental during this festive day. 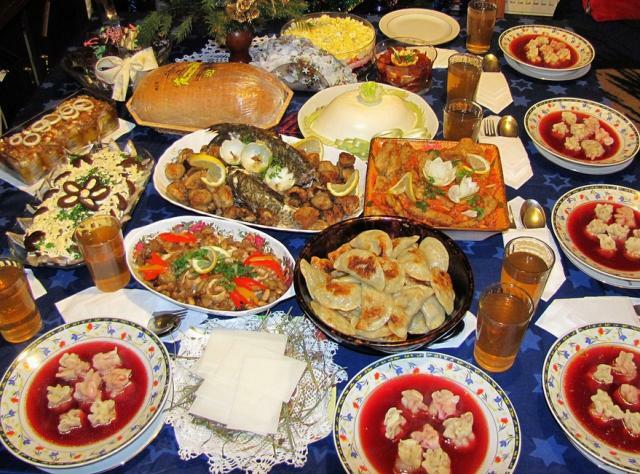 In many homes, Christmas Eve supper, in Polish called Wigilia / Vee-ghee-lee-uh/, includes twelve dishes. The number represents welfare and also has symbolic meaning, referring to the months of the year and the twelve apostles. First and foremost, the Christmas Eve meal should be a Lenten meal, i.e. eating meat is not allowed. However, fish is a largely popular main course, with the carp being the most famous of them. The commitment most probably dates back to the times when there were no other options than the mud-dwelling, bony species, and still remains strong, despite other available options. The carp is served in various ways: breaded and fried, in a light fish soup, in tomato sauce or in jelly. The Jewish-style carp, sweet in flavour, is an extremely popular variation of the carp in jelly. The fish is cooked in a broth with raisins, almonds and spices, and then served cold on a platter. When it comes to fish, herring with onions and apples in a cream sauce is another typical Christmas dish, served as a starter. The recipes for all Christmas dishes vary substantially, depending on the region. Sometimes it is a matter of one ingredient that changes the whole dish. For example, one anecdote often mentioned at a Polish Christmas table refers to one of the most famous Polish salads, made of boiled carrots, potatoes, celery, eggs and mayonnaise. All Poles know that there is only one recipe for it, and one way to prepare it, however it tastes different in every single household. Munching their second, or even third helping of the salad, the Poles often ponder about this unsolvable contradiction and mystery. The Polish Christmas Eve supper won’t do without red borscht made of sour base, in Polish known as ‘zakwas’, served with ‘uszka,’ small ravioli stuffed with forest mushrooms and cabbage. 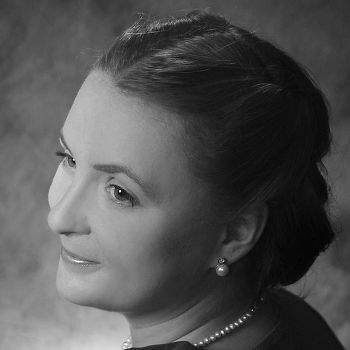 The term ‘uszka’ literally means ‘tiny ears,’ because of their shape. In many households, they are still hand-made, as for most traditional housewives buying ready-made, frozen ones is considered a big disgrace. In some regions of Poland, especially in the highland Podhale, the ravioli are replaced with large white beans. Generally, leguminous plants are often used in Christmas dishes. Beans cooked with sauerkraut, mushroom and spices make a typical Christmas stew as well as cooked peas prepared using blond roux, which gives it a creamy texture and buttery taste. Those with a sweet tooth always anticipate the dessert part of the Christmas Eve. This is when ‘kutia,’ is brought in, a sweet wheat berry pudding with raisins, dried apricots, poppy seeds, milk and honey. All dried ingredients are soaked with milk and honey, then mixture has to be put in the oven and baked. On the other hand, ‘kukiełka,’ which is nothing more but braided brioche bread layered with honey, is a much simpler, yet equally delicious way to celebrate Christmas. Another traditional Christmas dessert is a poppy seed cake called ‘makówka,’ which in every region has slightly different form. Sometimes the makówka is a small bun stuffed with poppy seed, and sometimes a huge cake made in a rectangular pan, or even a roll. As a rule, Poles do not drink alcohol during Christmas Eve, boosting their digestion with something else. A special compote made of dried fruits, mostly plums and apricots tastes quite unusual, and is unpalatable for some, however on Christmas it somehow turns quite tasty. That’s one evidence of Christmas magic! Nowadays, in many homes you can observe shy attempts to break with some traditions: the carp is exchanged for salmon or trout, there are less than twelve dishes, and less Lenten options appear on the table. There is, however, one thing that never changes: a Polish Wigilia is a very family event, which brings together relatives from all corners of the country at one table... and that's a comforting thought.